Hi everyone. 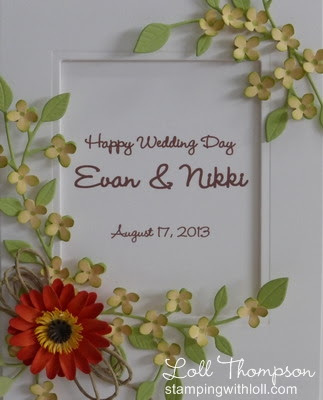 Today I'm showing you the wedding card I made for my son Evan and his new bride, Nikki. 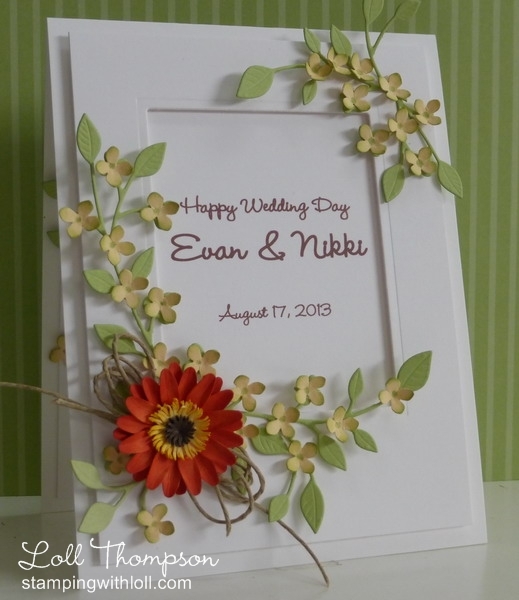 I used Nikki's wedding bouquet as my inspiration for this card. I included her favorite flower (orange gerbera daisy) along with soft yellow hydrangea blooms and twine (which she used to tie her bouquet together). I printed the sentiment on my computer in brown ink to match the center of the gerbera daisy. 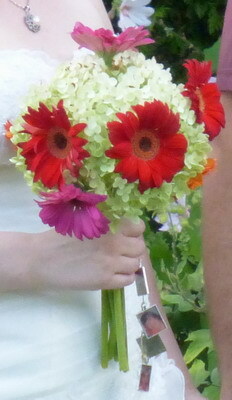 You'll notice there are four picture charms dangling from her bouquet. Evan also had four picture charms pinned to his shirt. They wanted to honor loved ones who have passed and weren't able to be there for their special day. Nikki had pictures of her two grandmothers, Evan's Auntie Nancy and Evan's Auntie Moe. Evan had pictures of his two grandfathers, Nikki's grandfather and Evan's Uncle Dave. It was a very special way of including them and it brought tears to my eyes. Love my new Lavish Branch die and think I will get a lot of use from it. What a cool thing to do! Surprise the guests....Your card is an awesome case of her boquet. The tribute of the pistures hanging from the boquet was so vry touching. Loved this story...and your card is amazing! What a beautiful wedding card Loll, and such a wonderful take on the detail in the bouquet. I love the idea of the memento charms - I can understand why you felt emotional. Congratulations to the happy couple - I hope you all had a fabulous day. Gorgeous card, Loll! It matches her bouquet just perfectly...I love how you added the trailing hydrangeas, too! I'm sure they appreciated all the special touches on your beautiful card! You're so special. What a beautiful wedding card. I'm going to have to buy the martha hydrangea punch. What a beautiful card. They must have loved it and will cherish it. A beautiful wedding card Loll your flowers are gorgeous a card to be treasured. What a lovely idea having photos of loved ones that are no longer with us a perfect card and a perfect bouquet . This would be a beautiful card under any circumstances but you've made it so personal for your special couple, I'm sure they'll treasure it forever. I'd wondered about the badges on Evan's shirt on your wedding post (I'm nosy like that), and now I know. They obviously thought of every detail to make the day special for everyone. This is beautiful Loll - so delicate. Fabulous that you could match your card to the bouquet.......perhaps the bonus of having the surprise wedding eh? A fab card Loll as usual. Absolutely perfect Loll, even more dynamic than you always do! I know your son was very proud! What a special card, Loll! I have no doubt that Evan and Nikki will treasure it! So beautiful! Loll, Gorgeous card, just love it, that is also one of my favorite flowers, I have not had the time to sit and type, but I am so happy for you and what a surprise that must have been, never heard of a surprise wedding like that, AWESONE, I don't believe she pulled it off, I bet everyone was so surprised!! So happy for you all, I have been loving all your cards of late, just not enough time in the day for me lately, well at least good hours where I can function well enough to come on line, and visit blogs and type comments, been watching all the cards, just not typing my usual comments, trying to catch up. Beautiful,special card! What a lovely gesture with the picture charms -I haven't heard of it before, really touching. Gorgeous, love the flower arranging! A beautiful wedding card Loll, I love that Branch die...I guess I am off spending..yet again! Such a beautiful personal touch for them.